This morning, 4am Australian Time, 1.30 in the afternoon New York Time, we were again following Pittwater and Australian sailors via the online live streaming of races a fair way away from here. This week two teams from Sydney, and the only crews from Australia, from the Middle Harbour Yacht Club, and Pittwater's own Royal Prince Alfred Yacht Club, have represented all in some wonderful sailing on water's were yachts have cruised since 1844 and sought others to race since 1851 - Newport Harbour, Rhode Island. America crossed the Atlantic on her own bottom and challenged all English yachts to a match race. No yacht was willing to race her, however. Finally, America joined a free-for-all on Friday, August 22, around the Isle of Wight. Watching the race, which included 15 English yachts and America, was Queen Victoria, who supposedly inquired, "Which is first?" Told it was America, she asked, "Which is second?" It was pretty wonderful watching RPAYC and MHYC in Race 11 overtaking some, being overtaken, and remaining in 9th and 5th place steadily as the commentators, who know this course, tell all watching 'they're coming up to the windward mark', or 'they haven't got puff' about one yacht, or 'they need some clean jibing' - and then see MHYC step up to 3rd! - and RPAYC overtake two. MHYC finished 7th and RPAYC finished 9th in race 11 - and then 'Currently on wind delay...stay tuned" - before the last race, Race 12, on what the commentators, two of them America's Cup champions, state is 'Championship Saturday'. 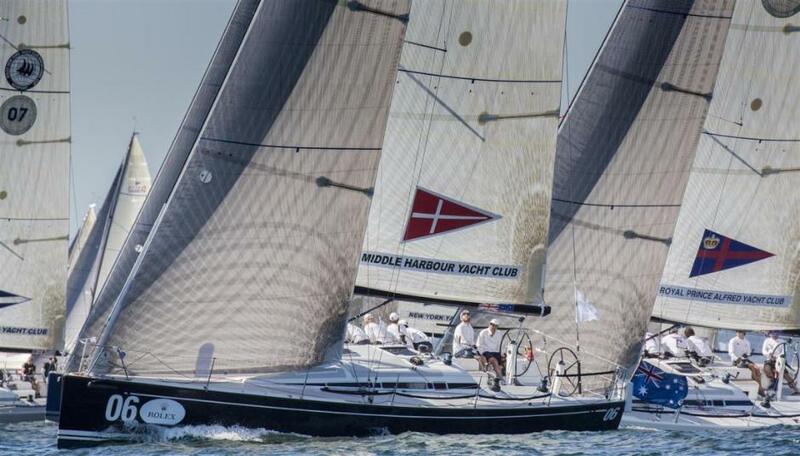 Earlier in the week Middle Harbour Yacht Club (MHYC) finished 1st in Races 2, 6, and 7 and was placed 4th and were 5th after Race 11 - while RPAYC won 2nd spot in Race 9 and placed a respectable 6th in Race 1 in the fleet of 17 boats. The New York Yacht Club Invitational Cup invites Corinthian sailors from the world's preeminent Yacht Clubs to compete in a fleet racing regatta held in Swan 42 Class yachts. The regatta is hosted by NYYC in Newport, RI in alternate years. It is a testament to the ideals of Corinthian competition, and the camaraderie associated with the sport that for the fourth edition of the Rolex New York Yacht Club Invitational Cup, six of the 17 entered yacht club teams will be welcomed back as four-time veterans of this highly-regarded event. Woven into the fabric of this event is the historic partnership of Rolex and New York Yacht Club, which was forged in the 1950s. Through this enduring association, one of yachting’s greatest traditions was established with a winning sailor being presented with a Rolex timepiece in recognition of achieving excellence in competition. At the conclusion of five days of racing (from 15-19 September) on Rhode Island Sound and Narragansett Bay, a Rolex steel Submariner Date timepiece will reward the winner of the 2015 Rolex New York Yacht Club Invitational Cup: the team which has succeeded at combining efficient boat handling and finding maximum boat speed. “We are proud to be back in this sophisticated and prestigious event,” said Yoshihiko Hattori on behalf of the Japan Sailing Federation (JSAF) team. The opportunity to represent some of the most prestigious clubs in the world, as well as one’s country, is a key motivation for the teams that repeatedly undertake the logistical and competitive challenges that are inherent in participating in an event of this calibre. The JSAF team has finished in the top six in each of their previous appearances in the Invitational Cup. Building their team for 2015 from a crew that has sailed together for over ten years and are three-time Japanese National Champions, they hope to improve on that record. Likewise, Irish helmsman Anthony O’Leary has assembled his crew based on their performance on his winning Ker 40, ANTIX. Representing the Royal Cork Yacht Club, generally considered to be the world’s oldest yacht club, could be a daunting task for O’Leary who focuses most of his sailing efforts on offshore racing. However, a 5-8-4 record indicates that while the Irish team infrequently sails one-design boats of the size of the Swan 42s used for the Rolex New York Yacht Club Invitational Cup, they are strong competitors within reach of the prize. Competitors must be Corinthian (non-professional) sailors and members of the yacht clubs they represent; they must also be nationals of their countries. 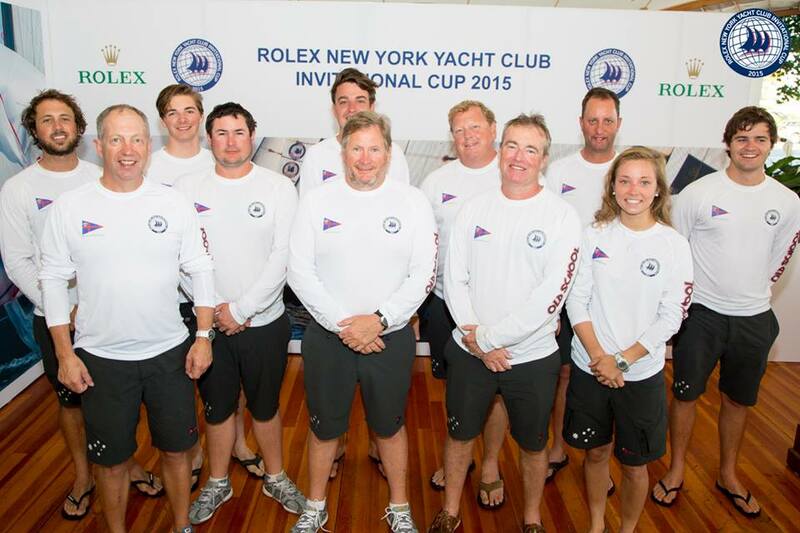 The 2015 Rolex New York Yacht Club Invitational Cup welcomes competitors from the following yachts clubs: the Royal Yacht Squadron (GBR), Japan Sailing Federation (JPN), Real Club Nautico de Barcelona (ESP), Royal Canadian Yacht Club (CAN), Royal Cork Yacht Club (IRL), Royal Hong Kong Yacht Club (HKG), Royal Thames Yacht Club (GBR), Yacht Club Argentino (ARG), Yacht Club Italiano (ITA), Royal Prince Alfred Yacht Club (AUS), Royal Swedish Yacht Club (SWE), Eastern Yacht Club (USA), Itchenor Sailing Club (GBR), Middle Harbour Yacht Club (AUS), Newport Harbor Yacht Club (USA), Seattle Yacht Club (USA) and New York Yacht Club (USA). In life there are few guarantees. In sport of sailing, however, an association with Rolex is a seal of authenticity that guarantees that both on and off the water an event – such as the Rolex New York Yacht Club Invitational Cup – is prepared for with meticulous attention to detail. Like the warranty on its fine timepieces, the company is continually setting new standards and those standards are extended to the regattas and yacht clubs with which it partners. An observation by several skippers was that the level of competition has stepped up. “Definitely the top end of the fleet is tougher,” said Ferguson. “It’s still early in the event, but one thing is noticeable – there are less mistakes; everybody is doing the basics well and I think there’s more intensity this year.” The team currently stands 12th overall after two days of racing. Zabetakis has a very unique perspective on the event: he has been involved from the outset in 2009, setting up and chairing the technical committee for the first two events. Despite a good season on his Swan 42, Impetuous, in 2013, he did not try to represent the home club as he had become chair of the 2013 event. With a solid commitment from his team, they embarked on a campaign for 2015 that included Key West Race Week, the New York Yacht Club Annual Regatta, and the Swan 42 Nationals, with the latter event won on the final day to secure the honor of representing the home team. Today’s lone race favored the teams who were in the right place to strike and who were proficient in sailing in light air. Genoa, Italy, where the Yacht Club Italiano is based, is known for light breeze and, with Leonardo Ferragamo at the helm, the team parlayed that experience to win the race. Second across the line was the Irish team representing Royal Cork Yacht Club. Skipper Anthony O’Leary, who has raced every edition of this event, credited finding a hole in the starting line with their performance in the race. After two days, Seattle Yacht Club has taken over the top spot in the overall standings although it is tied on points (22) with Royal Thames Yacht Club. Royal Cork is third overall with 24 points, and Itchenor Sailing Club is fourth with 27 points. Three points back, tied at 30 points apiece, are Marblehead’s Eastern Yacht Club and Toronto’s Royal Canadian Yacht Club which is the two-time defending champion. The winning team is determined at the conclusion of racing on Saturday, September 19, New York Time. regattanews.com is the comprehensive media source for the events that form the Rolex Yachting Portfolio. The Rolex New York Yacht Club Invitational Cup has been partnered with Rolex since 2011. The event forms a proud part of Rolex's association with yachting and the world’s leading yacht clubs in particular.